First, a bit of shameless self-promotion! This week, I'm participating in Novel Publicity's Social Media Whirlwind Tour to advertise Terri Giuliano Long's book In Leah's Wake. Monday's post was a Twitterview with the author, today's post is an excerpt from the book, and tomorrow post is an interview with the author. Very interesting stuff, be sure to check it out! The self-promo part: if you go to Terri's blog, you can vote for the bloggers participating in the tour, and I'd be ever-so-grateful if you'd go and vote for Ramblings of a Daydreamer. It would only take a second, and it would mean a lot to me. As incentive, I've been thinking of holding a 200 follower giveaway (I'm getting so close!) and if I win the Amazon gift certificate, that would help fund the giveaway. So please, please go vote for me! I'm on page 39 of Brightwing by Sullivan Lee, an ebook I'm reading for review, and I just finished a paperback, so I'm about to start Dead Over Heels by MaryJanice Davidson. Tonight, I finished Falling in Love With English Boys by Melissa Jensen. I should have the review up Saturday, I think. Before that was That Day in September by Artie Van Why (review will be up next week, along with a guest post from Artie), Vampire Kisses by Ellen Schreiber and Rules of the Road by Joan Bauer. Since I'm such a slow reader, I've been picking shorter books lately, so I've been getting more read! I have a few to choose from: Until the End of Forever by Shannon Hart, and Love at Absolute Zero by Christopher Meeks are paperbacks I received as part of blog tours happening September and October. I also finally got Paranormalcy from the library and I'm anxious to find out what all the fuss is about. And, if all that wasn't enough, I have 4 or 5 ebooks for review and a couple of review books coming in the mail. With all that, I'm not 100% sure what's next, but I love having all these books! Synopsis: Debut novelist Kiki Hamilton takes readers from the gritty slums and glittering ballrooms of Victorian London to the beguiling but menacing Otherworld of the Fey in this spellbinding tale of romance, suspense, and danger. The year is 1871, and Tiki has been making a home for herself and her family of orphans in a deserted hideaway adjoining Charing Cross Station in central London. Their only means of survival is by picking pockets. One December night, Tiki steals a ring, and sets off a chain of events that could lead to all-out war with the Fey. For the ring belongs to Queen Victoria, and it binds the rulers of England and the realm of Faerie to peace. With the ring missing, a rebel group of faeries hopes to break the treaty with dark magic and blood—Tiki’s blood. I love, love, LOVE faerie books and this sounds so good! I really like the concept, and like many others, I can't wait to read this book! I've seen this one around but haven't decided on if I want to read it yet. have you read Clare Dunkle's The Hallow Kingdom series? It's fantastic. More on the side of goblins, but almost the same diff...sometimes. Good choice! Am very anxious to get my hand on Faerie Ring too. It has been a while since I got a chance to read a good fae book. Great pick! I am waiting for the Faerie Ring. I hope it is as awesome as it sounds. 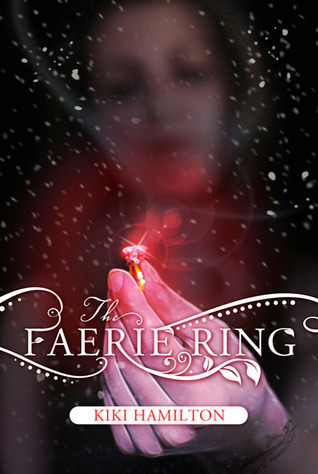 Look forward to your review of Faerie Ring! :) It sounds great. This sounds like a good book. I think it is on my TBR list. The Faerie King looks really good! I want to read it.